Keeping your greens smooth just got easier! 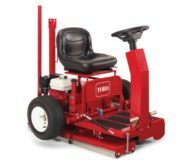 The Toro GreensPro® 1200 riding greens roller is the perfect rolling tool for fine sporting turf such as golf greens, bowling greens and tennis courts. Turf that requires a smooth, high performance surface for optimum playing will benefit from precision greens rolling with the GreensPro greens roller. Honda GX200 air-cooled, 4-stroke OHV; mechanically governed.